Gas lines require piping systems that deliver high quality, high performance and are maintenance free. This makes Dadex’s T-flex pipe system for gas the ideal solution. Our specially produced T-flex gas pipes have been successfully installed throughout Pakistan for the supply and distribution of gas. High strength and stiffness to withstand internal pressure and external loads. Impact resistance for lower cost installation, narrower trenches (reduced excavation), and fewer expensive fittings. Heat fusion joining for strong, lifetime leak-tight, fully restrained joints. Remains flexible at sub-freezing temperatures. Retains long-term strength at elevated temperatures. Does not rust, rot or corrode or support biological growth. Retains low resistance to liquid flows for reduced pumping and operating costs. Dadex PE gas pipes are available in the following diameters: 20, 25, 32, 40, 50 and 63 mm in coil of length up to 100 meters. 75 and 90 mm diameter in coils up to 50 meters length. 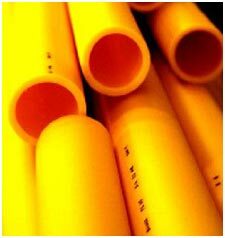 110, 125, 140, 160, 180, 200, 225 and 250 mm diameter in straight length of 6m/12m. A complete range of T-flex pipes for gas is available in imperial sizes of ¾”, 1”, 1¼”, 1½”, 2”, 2½”, 3”, 3½”, 4” and 6”.